You can edit or delete messages, files, or images that you have already sent. The search results that recipients see in the chat will reflect the content of your edited message. 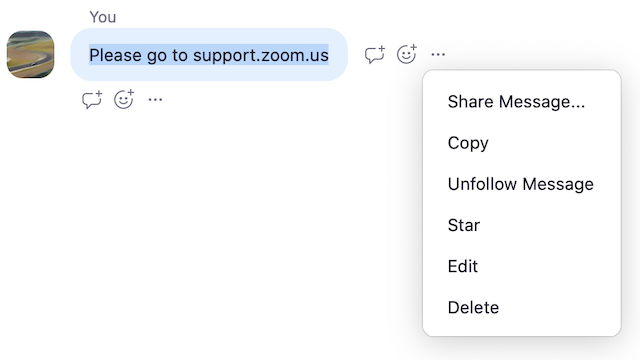 Although the recipient does not receive a notification, deleted chat content and files are no longer accessible within Zoom. 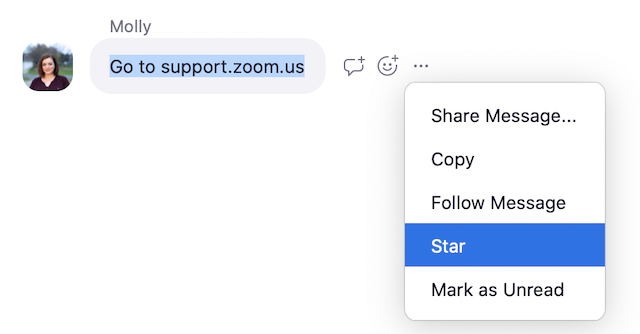 You can place a star on important messages, copying them to the Starred Messages chat and allowing you to quickly view them later on. Hover over the the message you want to star. Click the star icon next the message. Click the Starred Messages chat thread to see your starred messages. If the original thread was with another contact, you will see posted in followed by the contact's name. If you starred a message in a channel, you will see posted in followed by the channel's name. Hover over the message and click the yellow star icon to unstar your message. Click Jump to view the original chat thread. You can edit the content of a message that you have already sent. Hover over the message that you want to edit and click on the arrow. Change the text and click Save. It will now show the edited message, and indicate that it has been edited for all chat participants. You can delete a message that you sent at any time. Recipients will no longer be able to see it. Hover over the message you want to delete and click on the arrow. It will show You deleted a message, but other participants will not see that notification. If you sent a file in the chat, you can delete it. Recipients no longer have access to the deleted item within Zoom. Right click or control-click on the item you want to delete. If you sent a picture in the chat, you can delete it. Recipients no longer have access to the deleted item within Zoom.